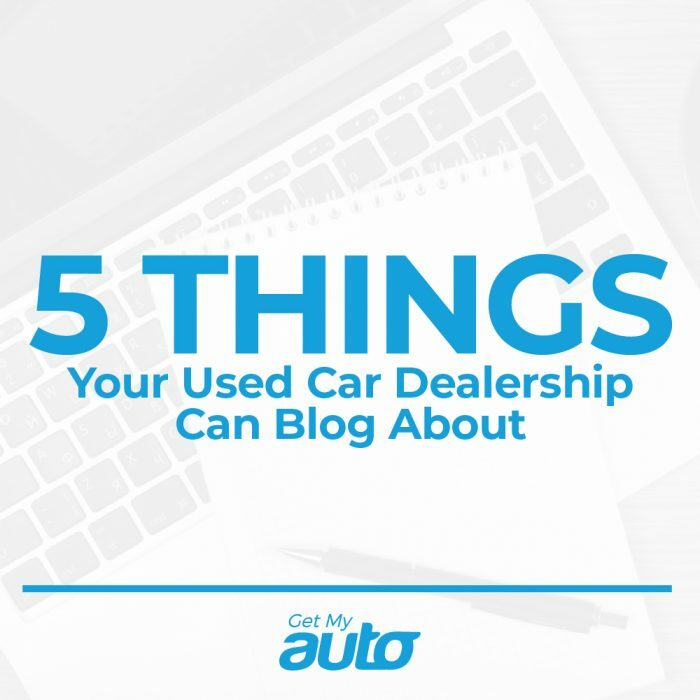 A blog can prove highly advantageous to your used car dealership. It provides you with a way to communicate your subject matter expertise, to earn the trust of your readers, and to educate buyers before they come into your dealership. However, blogging is not without some challenges—and one of the biggest ones is just knowing what to blog about. Here are five basic suggestions we’d recommend for your used car dealership. 1. Share tips on vehicle maintenance. A car—even a used car—is a big investment. Show your buyers how they can protect that investment—and let them see that you want to help them as they do so. Blog about some of the best strategies for keeping a car in good working order, including general tips about preventative maintenance like oil changes, tire rotations, brake inspections, etc. 2. Provide a used car buying guide. One of the best things about a blog is that it allows you to earn the trust of your readers. For instance, offer buyers some guidance on what they should and should not do while shopping for a vehicle. What questions should they ask their sales rep? What should they pay attention to while test driving? Help buyers make smart purchasing decisions. 3. Advise on auxiliary products and services. In addition to buying a vehicle, your buyers will also need to buy things like insurance—but what kind of policy do they need? Use your blog to deliver some general tips and suggestions. You might also use your blog to review after-market products that a used car buyer could be interested in. 4. Share safe driving tips. A blog allows you to come across as more human and relatable to your buyers—for example, by showing them some ways to be safe on family road trips, or some guidelines for keeping their little ones secure in the back seat. General safety guidelines can be great fodder for any used car blog! 5. Highlight your work in the community. Does your used car dealership sponsor a local charity or non-profit? Do you collect funds or donated goods for a homeless shelter, for example, or for a local school? Any kind of community involvement is helpful for generating some goodwill with your buyers—so make sure you highlight these things on your blog! Choosing the right subject matter is an important first step for your dealership blog. Make sure you maintain a consistent blogging schedule, too. Include a call to action in each post. And, always share new blog content on social media and your email list. That’s a lot to think about, but we’re here to help. For guidance through the used car blogging process, reach out to Get My Auto. Our automotive marketing experts are here to help you grow your dealership, so contact us whenever you’re ready to chat!